The thought of making laksa never really cross my mind. There is a stall near my home where they made a decent bowl of laksa. And the stall owner always catered to my needs – I only want prawns and beancurd puffs. However during a recent trip to Chinatown market, I remembered Anthony the Spice Maker whom has supplied me mustard seeds when I couldn’t find them (now I realised there are tons at Mustafa). I also recalled Anthony sells different type of paste – curry paste, nasi lemak chilli paste and laksa paste. After a chat with Anthony on the cooking method, I bought a tub of laksa paste to try. 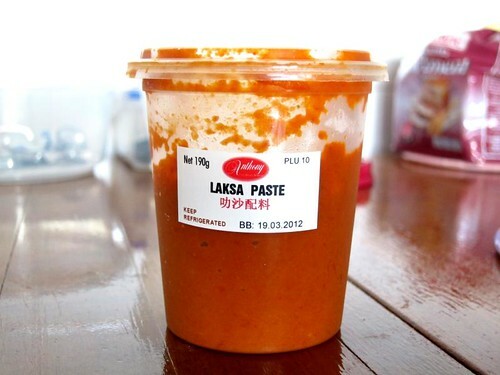 Anthony told me his laksa paste is freshly blend and no added preservatives hence it is to be used as soon as possible. I have also decided to make my laksa a little bit healthier. I used a combination of low fat coconut milk (which is a lot thinner) and chicken broth for the soup. The result is a more drinkable laksa broth without making you feel sick or heavy. 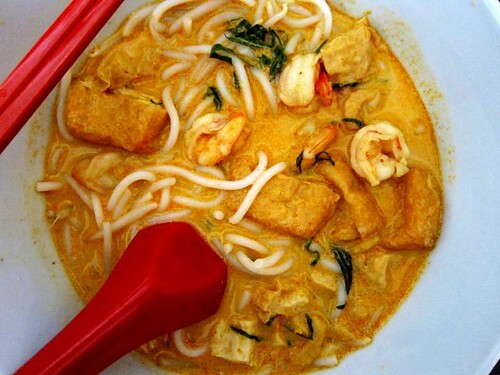 The best thing about making your own laksa – you can put in whatever ingredients you want.